Budapest is one of those cities that has a lot to offer but doesn’t require a great deal of time to enjoy. That makes it the perfect destination for a brief visit – two days to be exact! At first I was concerned that my 48 hours weren’t going to be enough for this excursion to truly count. However, I was pleasantly surprised to discover that once you have a good pair of walking shoes, a sense of adventure, and conditioned to rise with the sun and rest long after it has set, there’s a whole lot you can do with just two days in “the city that unites”. 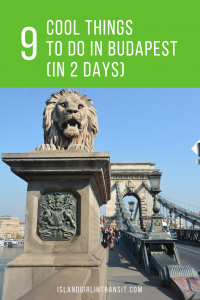 So, here are 9 fun things you must do in Budapest if two days is all you have to spare. I’m a bit of a fast-talking chatterbox and I’m rarely rendered speechless. However, upon exiting the dreary metro station and spotting the magnificent sight of Hungary’s Parliament building, I lost all my words. At 268m in length, 123m in width and reaching 96m at its highest point, this massive gothic building is a detailed work of art. It’s also the third largest parliament in the world. Approximately 100,000 people were involved in its construction, using around 40 million bricks, half a million precious stones and 40kg of gold, to deliver the impressive final product. Tours of the interior are available and tickets can be purchased online. If however you’re not inclined to venture inside, just walking around the perimeter and soaking in the details is enough of an undertaking to occupy at least an hour of your time! Lunch, dinner or just drinks. Daylight, sunset or by the light of the moon. 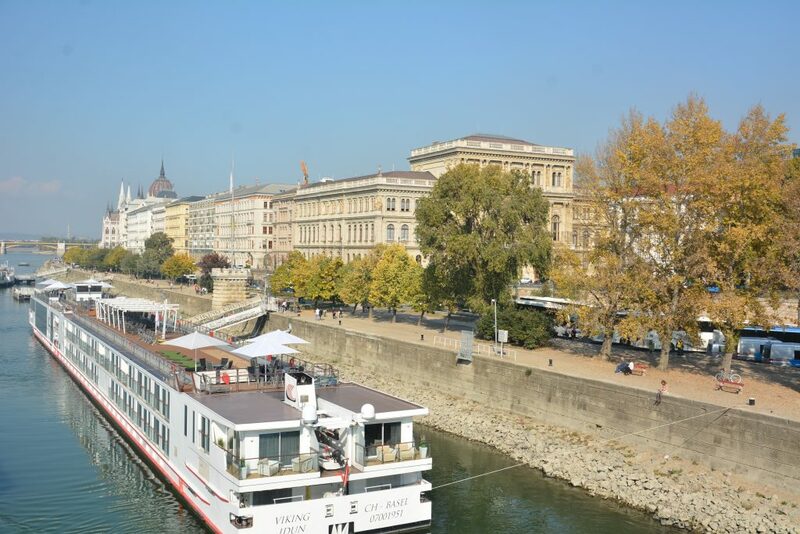 Whichever way you do it, you absolutely must take a cruise along the Danube River. Options abound when it comes to sailing along the second longest river in the Europe. We opted for a lunch cruise because we wanted to take in the views from the river by day. 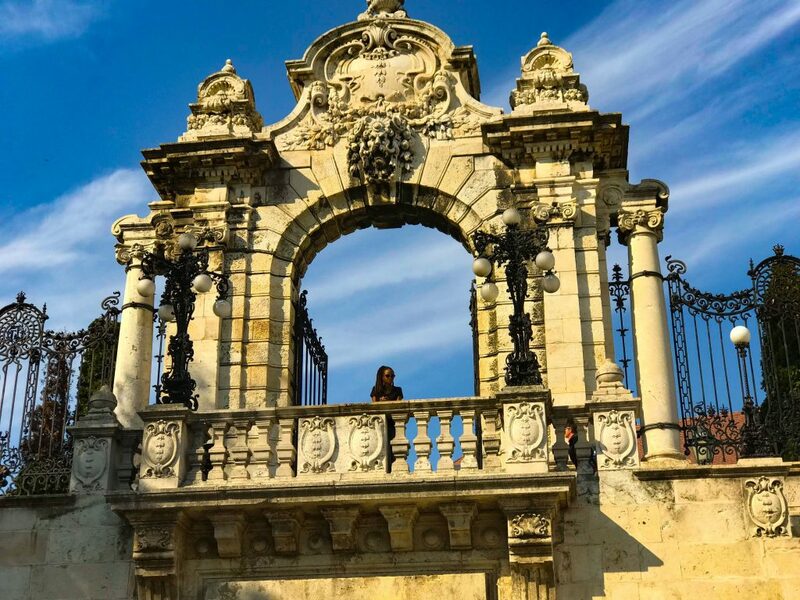 While our eyes feasted on gorgeous uninterrupted views of the beautiful architecture that lines the Pest riverbank and soaked up the grandness of Buda Castle on the opposite side, we enjoyed a lovely all-you-eat buffet. 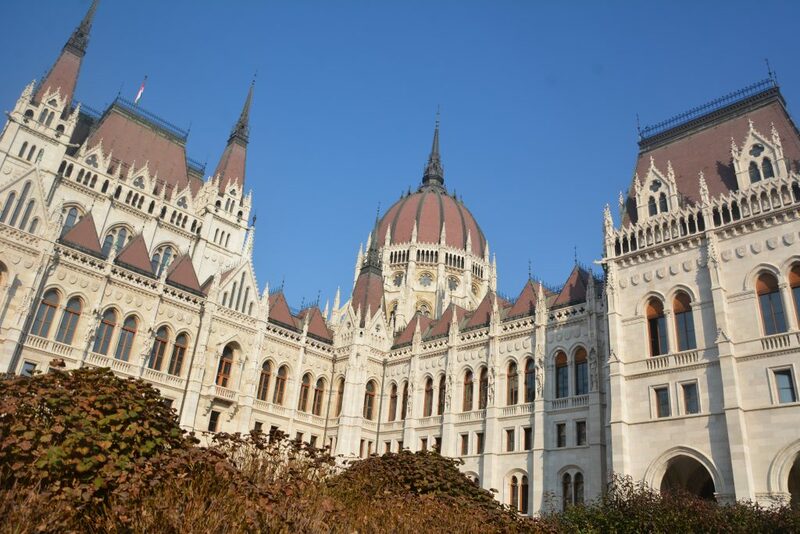 When it comes to fun things you must do in Budapest, you can’t be lunch with changing views! When it comes to thermal baths in Budapest, there’s no shortage of options from which you can choose. Some, like the Széchenyi Thermal Baths, still possess their old world architecture and charm. 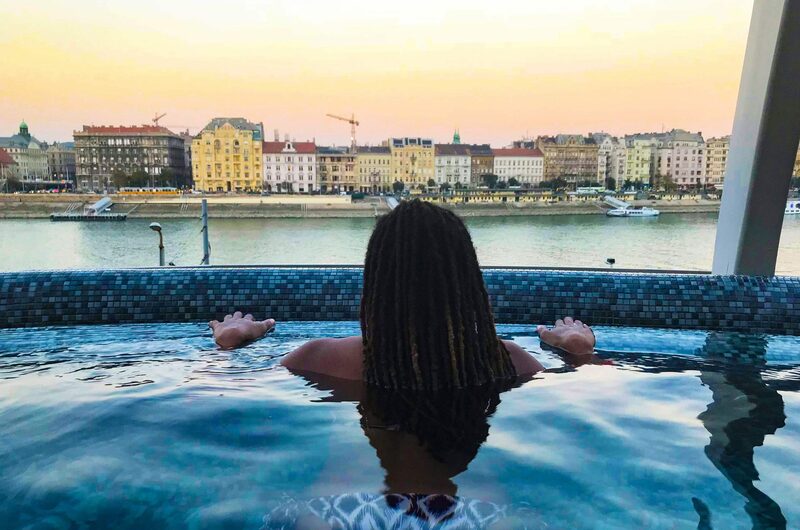 While others like the Rudas Baths have undergone a few upgrades, including a very chic rooftop hot tub that delivers sweeping views of the Pest skyline. A popular destination for most visitors to the Rudas Baths, the pool is usually crowded and it takes great patience to secure yourself a spot with a view. But, whether your wait is 15 minutes or 50, it’s definitely worth it to capture the perfect shot. 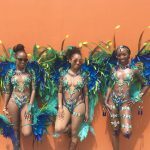 Of course there are other pools with various treatments that are certainly worth your time so purchase a package that allows you to indulge in several of them. After a few hours of their warm and healing properties, you’ll be fully recovered from your day of walking. Who doesn’t enjoy a good bird’s eye view? And from a large ferris wheel no less! 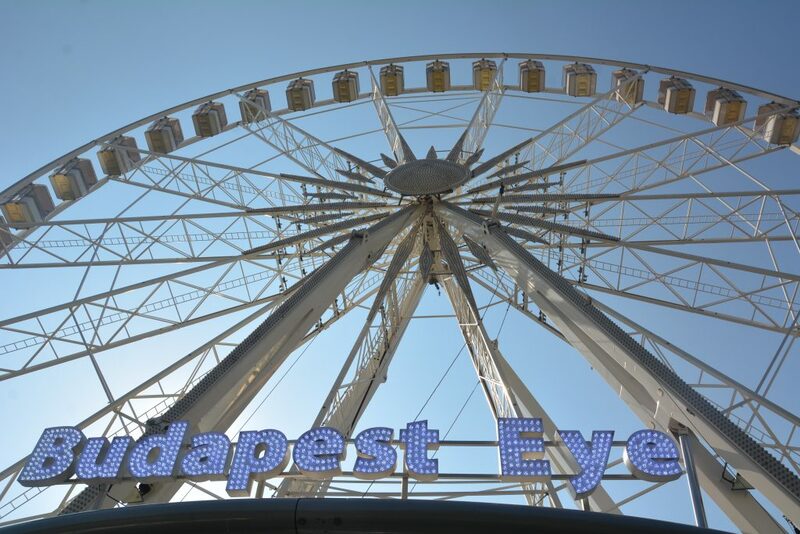 The Budapest Eye is a far cry from the London Eye in terms of size but, at 65 m, it’s the largest mobile ferris wheel in the world! The Eye offers a nice leisurely break in the middle of a day full of walking. Hop into one of the gently rocking cabins and make a few revolutions as you take in uninterrupted views of the Danube River, some of the larger monuments in Buda and of course the hustle and bustle of the activity taking place on the ground in Pest. 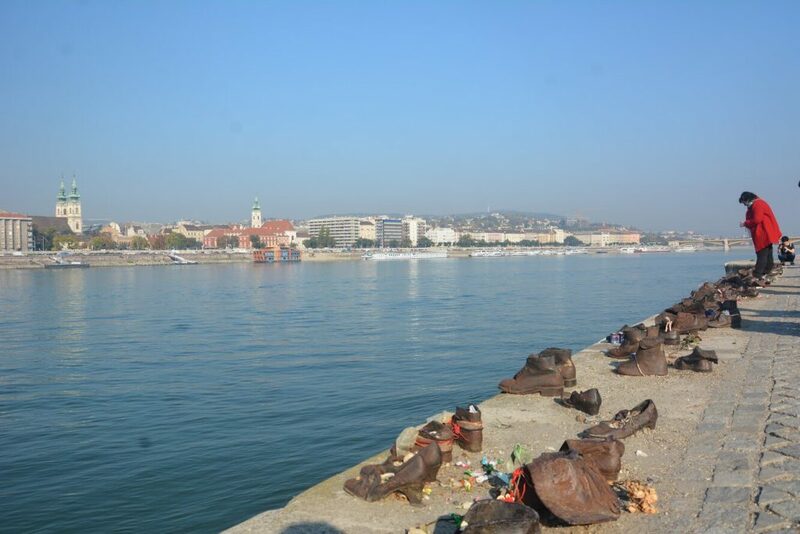 The Shoes on the Danube Bank is a powerful memorial to honour the memory of the 3,500 people killed by Arrow Cross militiamen during World War II. A collaborative effort between director, Can Togay, and sculptor, Gyula Pauer, these 60 pairs of iron shoes represent the shoes the victims were ordered to remove before being shot on the bank of the river. Please note, if you do opt to visit this tribute, please be genuine and respectful. This should not be used as a photo opportunity. While there I saw too many people pausing mid “tribute” and posing for photos as they placed coins and other tokens in the shoes. It wasn’t very tasteful and definitely not an action I can condone. Go for the history, stay for the views! Buda Castle is located on, you guessed it, the Buda side of the Danube. Which means it delivers gorgeous views of the stunning Pest skyline. A World Heritage Site that dates back to the 13th century, the castle grounds stretch on for miles. 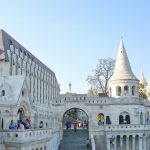 It includes a host of places of interest, from the Presidential Palace to the Fisherman’s Bastion to the Matthias Church. There’s so much to grab your attention, you could easily spend an entire day there. But, with only 48 hours to play with you’ll need to prioritise your stops. My advice? Do your research in advance and prepare a plan of action that allows to cover as much ground as possible. I’m not one for souvenir shopping but if you’re looking to bring back a piece of Budapest with you, you need to make a stop at the Budavári Sokadalom craft market. A stone’s throw away from the entrance to Buda Castle, this cozy little market is filled with vendors selling traditional Hungarian wares. They offer everything from elaborate Christmas ornaments to colorful matyó embroidery – an element of Hungarian folklore that is catalogued on the World UNESCO Intangible Cultural Heritage list. It’s the perfect one-stop-shop with friendly vendors who know how to be attentive without being a nuisance. 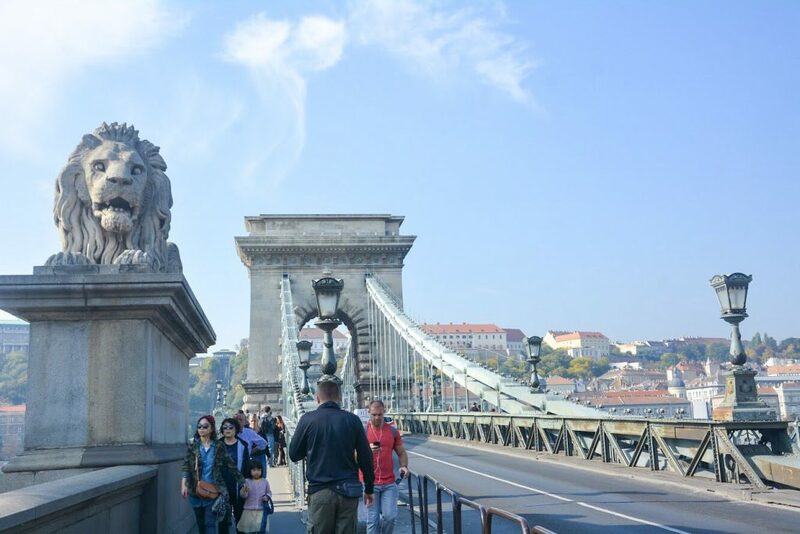 The Széchenyi Chain Bridge is to Budapest what the Brooklyn Bridge is to New York City. A beautiful icon that commands your attention and demands your admiration, you can’t visit the city and not walk along this engineering marvel. Flanked on both sides by two domineering lions, crossing the bridge from east to west (or vice versa) is an easy walk that treats you to great views on either side. An early morning stroll will greet you with gorgeous sunrise skies and uncluttered pathways. Making this walk at nighttime means taking in the magic of Budapest lit up in all its glory. No matter what time of day you choose to do this, it will be an amazing experience with incredible scenes to take in! 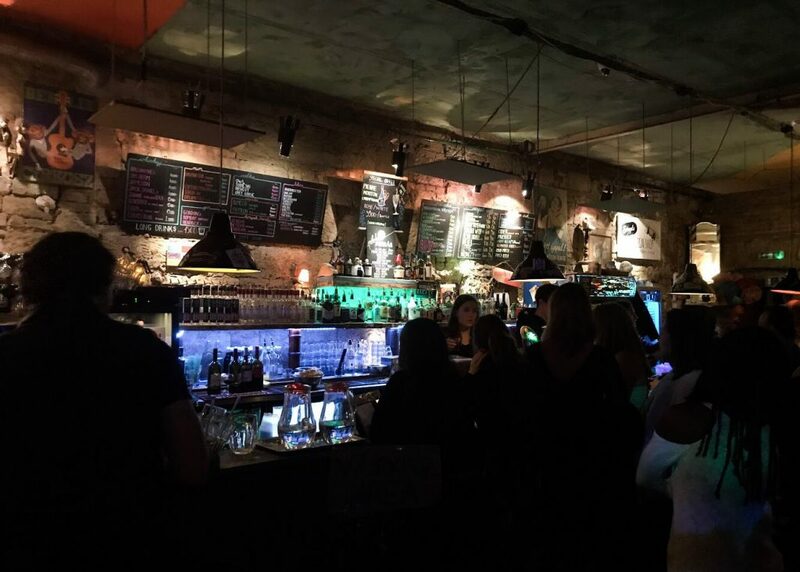 Forget the historical castles and healing baths, ruin bars are quite possibly one of the Budapest’s most popular attractions. Eclectic watering holes established in previously abandoned buildings in the once crumbling, historical Jewish Quarter, ruin bars are now the heart of soul of the Budapest’s nightlife experience. Artfully mismatched furniture, kitschy decor, psychedelic lighting, pulsating music and an expansive range of cheap drinks attract thousands to the cavernous interiors of these ultra hip spots on a daily basis. Szimpla Kert, with its multiple levels and rooms, pioneered the movement and should be top of your ruin bar hop list. 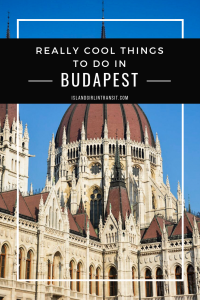 However there are several others worth checking out, which you will find on this list by Offbeat Budapest. 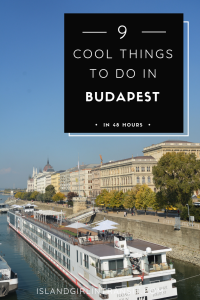 Budapest has a lot to offer everyone so this list barely scrapes the surface. 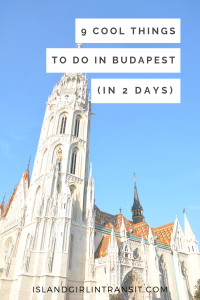 However, if two days is all you’ve got these are my top pics for 9 cool things you must do in Budapest. Have you been to Budapest? 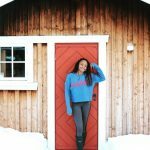 What fun experiences did you have that didn’t make my list? Feel free to share in the comments! European Parliament buildings are always so pretty! Haha, another city with a Ferris Wheel “Eye”, I usually skip those as I never find them worth the money. The Budapest bath house are super famous, and I would definitely not skip those. I haven’t been to Budapest, it is high on my travel list. Just to cruise along the Danube would be so much fun. I did not know about the history of the ‘shoes’ on the Danube, thank you for telling the story. I also love castles so a visit to the castle would also be high on my list of things to do. Maybe 48 hours is not long enough for me to see everything that Budapest has to offer. I’ve still not made it to Budapest, even though it’s only 1.5 hours away! I love the Parliament building, I never tire of looking at photos of it. As a wellness traveler, I’d definitely book some time in for the bath house too. All these places are incredible! Stumbled upon your blog through Pinterest. Love the overall clean theme going around here. I’ve been trying to figure out a second city to add to my Europe trip this summer and I think you’ve just cinched it for me! I hadn’t even considered Budapest but it looks amazing. 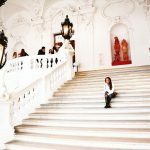 I especially want to visit the thermal baths- traveling with fibromyalgia means that lots of walking makes me very stiff and sore and really gets in the way of enjoying a new city. I’ll definitely check out the Budapest Eye, too. I randomly found myself on the London Eye at sunset one time and the photos I took turned out to be the best ones of my entire trip. So I’ll try to time my trip on the Budapest Eye the same way! Also, I didn’t know that ruin bars were a thing, but now I’m instantly obsessed. Great list! 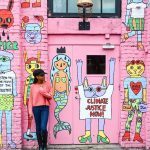 So happy this post helped you add another city to your Euro trip! I think you’ll love Budapest and the baths will definitely be a good treatment for your fibromyalgia. Also, the Ruin Bars are a must! So fun and quirky! This is such a perfect itinerary for Budapest!! Covers all the important touristy places, but also lets you dive into its history in just two days. 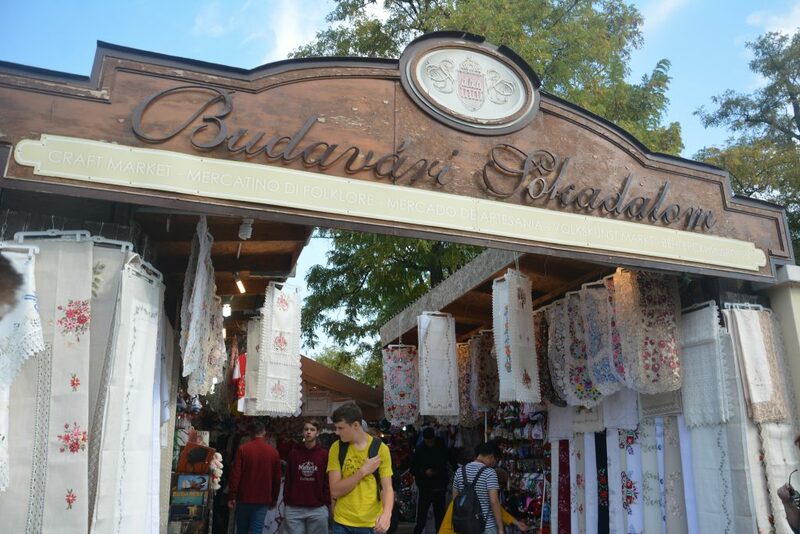 Also Budavári Sokadalom Craft Market sounds like a fun place!!! I went to Budapest last summer also for two days! The city has to much to offer and I haven’t had a chance to see everything! Its so amazing tho! I loved the castle, the parlament, the eye, the ruin bars or the food! I definitely have to back there at some point! Love your photos! Been there done that except taking the cruise on the Danube, and checking out the baths. But I simply love Budapest, and I consider myself to be lucky as I got to enjoy Budapest, both under normal conditions and under a blanket of snow. Spending a relaxing time at Budapest bath houses would be great. It is like experiencing the old tradition and enjoy the old architectures that surrounds you. What do you think are the best months to visit Budapest?